A Swedish designer has created a prosthetic arm that transforms a child’s disability into a challenge in creativity and design. The IKO Creative prosthetic system is not only functional, but also fun as children are able to build their own structures to use with their arms. And, best of all, they’re made from Lego. See how this ingenious invention came about and watch the reaction as one lucky boy gets to try out the new system. There have been some pretty incredible things made out of Lego – a 30,000 bricks Titanic replica, a fully-drivable car, a rocket ship, even. But we are loving this brilliant Lego invention that will bring smiles to children around the world. 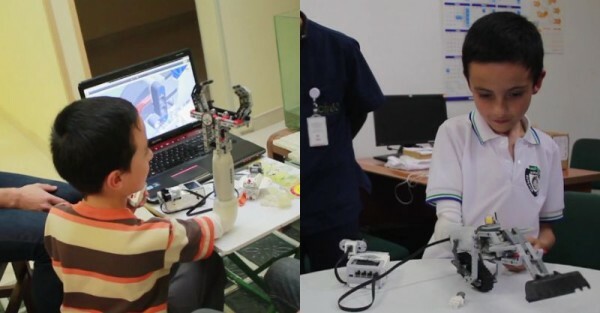 Using a bit of engineering genius and a whole bucket of Lego, he designs a prosthetic arm into something so much more. Made from a motion-reading sensor socket, a small engine, a rechargeable battery and a motorised “muscle” component, Torres’ prosthetic arm can then attach to any creation made out of Lego and make it move. Torres took his idea to Bogota, Columbia to test it out on young Dario. Together, Dario and Torres create various Lego-based attachments to use with the arm socket. They design a tractor arm, a laser beam rocket ship arm and a gripping-claw arm – all of which are fully functional. As Torres explains, at the centre of his idea is the “notion of play – learning, creating, being kids.” There is no doubt that Torres’ Lego arm has allowed Dario to do just that.